This short video describes the measuring, assembling and installing of a Perfect Fit Venetian blind but the same applies to Perfect Fit Pleated blinds. The Perfect Fit system consists of three components, an aluminium extrusion cut to length, 4 corner pieces and 4 corner covers then either a pleated or venetian blind is mounted to it and the whole assembly fits against the glass of a double glazed window or door. 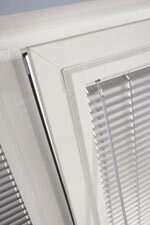 It is held in place by spring clips which slide in between the glass and the black rubber gasket of the double glazed unit, this enables the end user to clip and unclip the Perfect Fit blind from the window at any time without causing any damage to the window or the blind. The blind becomes part of the window and as such enables the window to be opened for ventilation whilst the blind provides shade without the flapping you get with other types of blinds plus there are no loose cords so are completely CHILD SAFE. This is the ultimate easy clip to fit, D.I.Y. blind on the market. Perfect Fit blinds fit 95% of all U.P.V.C. windows and these include:- Tilt & Slide Patio doors, Back Doors, Front Doors, French Doors, Top, Side & Bottom hung Windows, Tilt & Turn Windows. We can also fit to Bi-Fold doors provided the gap between the doors when folded is greater than 12mm. The Perfect Fit blind system clips to the window, this allows the window to be opened for ventilation leaving you free to choose if the blind is open or closed for privacy but the window sill is kept free at all times. The Perfect Fit blind frame protrudes 6mm from the window frame so will not normally interfere with the window handles but on the rare occasion that they do we supply, free of charge to all our customers, spacers to give the correct clearance. The operating cords for the blind are all tensioned and sit within the blind and frame and therefore no loops for a child to hang themselves with which makes this blind system completely CHILD SAFE. 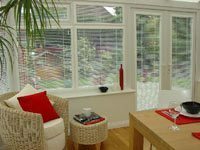 We supply the Perfect Fit blind in four frame colours:- White, Brown, Mahogany or Golden Oak, the two wood colours use the same wood effect film as used on your UPVC windows so you are assured of an exact colour match. The pictures on this page show the neatness and versatility of the Perfect Fit blind system. It was no surprise to us or our customers that this blind system would be the run away success that it is and has become our number one seller. We offer a FREE Sample service to ensure that you get the exact colour match that you require, simply leave your details on our Contact Us page with the colours you require and these will be despatched by first class post. We hope that we have answered most of your questions about the Perfect Fit System but please feel free to contact us with any questions you may feel we have not answered as this is something we welcome. 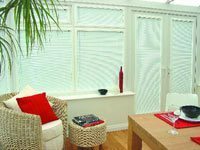 To obtain a quote please click on All Categories to choose your blind preference and insert your sizes.